It’s time we lay our cards on the Thanksgiving table: many of us aren’t exactly in love with cranberries. Every year Americans pass platters of turkey, bowls of vegetables and boats of gravy, while gelatinous cylinders of cranberry sauce—their bellies banded with ridges from the cans in which they were entombed—sit untouched. Sometimes, in a gesture to the beleaguered cook, a brave few plop some homemade chutney onto plates mounded with mashed potatoes and stuffing. Then, as with turkey-shaped oven mitts, all traces of the fruit disappear until next year. Yes, cranberries are the neglected stepchild of the season. But if guests at the holiday table knew what went into growing the perfect scarlet berry, and if cooks understood the challenges of working with a fruit so sour it makes your jaw sing, the humble cranberry might just be looked upon as the noble autumnal fruit it is, right up there with quince, pomegranate and persimmon. 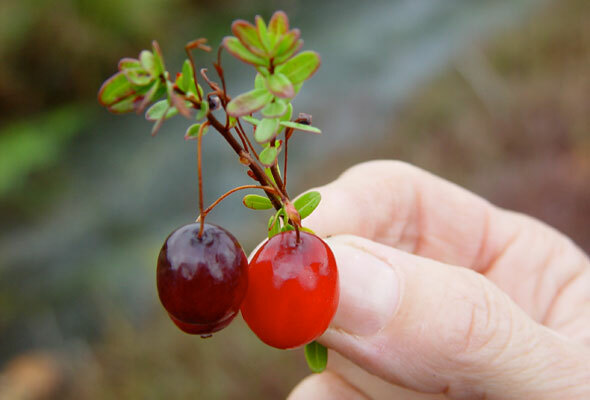 Considered one of three commercially important fruits native to North America and unknown to European settlers (the others are blueberries and Concord grapes), cranberries were used by Native Americans as food, dye and medicine long before they were co-opted by Thanksgiving advocates. Because of Thanksgiving and the Pilgrims, Massachusetts will forever be associated with the cranberry, but it produces only 25 percent of the nation’s crop, estimated this year to be almost 360 billion cranberries. Wisconsin is responsible for 50 percent, with New Jersey and Oregon harvesting a respectable 7 percent each. Washington, Maine, Michigan and Minnesota round out the roster. 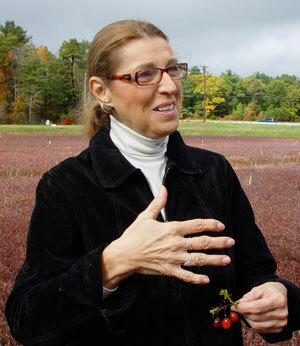 Ms. DeGrenier’s farm here—one of eight scattered along the Cranberry Trail, a web of bog-flanked roads near the arm of Cape Cod—specializes in dry harvesting, a method of picking cranberries that dispenses with flooding the bogs. “It’s best for fruit that will be bagged and sold as fresh produce, which is what everyone uses to make sauce,” she said. Just a tiny percentage of the national yield is dry-harvested. Although more labor intensive and costlier than the more familiar wet harvesting, it is gentler on the fruit. Wet harvesting may look poetic, with large booms corralling floating crimson islands, but it can bruise the cranberries, which are thwacked from the vines with paddles spinning underwater, then pumped into trucks. No harm done, though, as wet-harvested fruit is pressed into juice or dehydrated into sweet-tart dried cranberries. To dry-harvest, Ms. DeGrenier said, a farmer drives a mechanical harvester that gently combs the berries from the vines and then trundles them up a conveyor belt and into a burlap bag. From there, the cranberries are sent to a separator, where they undergo the bounce test, a determination of quality. The better, or firmer, the berry, the farther it bounces. Ms. DeGrenier’s berries are dumped into a hopper and then face a gantlet of angled wood slats. The softer, pudgier specimens slump against the slats, and, without enough brio to make the jump, fall into a discard box and are earmarked for the compost heap or for biofuel research. Slightly livelier berries head off to the juicer, while the Grade A berries bounce and catapult to the conveyor belt below to be sorted and packed, destined for the table. Of the three major varieties grown in Massachusetts, the indigenous heritage berries, Howes and Early Black, are the favored dry-harvest fruit for the few farms that use that method. “They’re heartier and can handle all that bouncing in the separator,” said Keith Mann, owner of Mann Farms, in Buzzards Bay, “plus, they get a really great crimson color, especially Early Blacks”—the physical and cosmetic requirements for model holiday fruit. Stevens, a large hybrid berry, is almost always wet-harvested. While cranberries are top of mind for cooks in November, they are a never-ending proposition for farmers. Besides having to be tended in the growing season as well as throughout harsh winters, the plants, especially those near the ocean, are susceptible to all kinds of problems. “A severe storm,” Ms. DeGrenier said, pointing south toward the nearby bay, “and the bogs can flood with salt water.” If that weren’t enough, whenever fertilizer or an herbicide is needed, or bins of dry-harvested berries have to be removed from the bogs, a helicopter is used, one of the few pieces of equipment that won’t trample the vines. Granted, knowing all this may give people a greater appreciation for this high-maintenance fruit, but it won’t necessarily tempt them to eat it. For that, it takes an understanding of cooking with one of the kitchen’s tartest ingredients. Another way of working with the zing of cranberries is with fat. He lists butter and duck fat as ideal ingredients for enriching the flavor and softening the sharpness of cranberry sauce or relish. “One of the reasons I think my relish goes well with meat is the marriage of the piquancy of the berry and the fat,” he said. Of course, most of us serve cranberry sauce alongside turkey, a very lean bird. To counteract that, Mr. Maws adds a knob of butter to his relish, along with savory notes of rosemary, sage and onion. Because of their tweaking and culinary negotiating, all three chefs are able to look beyond the glut of late-November turkey dishes to find other uses for the berry, something Mr. Maws suggests the home cook try. Cranberries, whether raw or cooked, “freeze really well without suffering a loss in quality,” he said. So throughout the winter months, he serves port-poached cranberries with venison and matsutake mushrooms and as a warm sauce poured over sassafras-poached pears. Mr. Schlow partners fatty yellowtail sashimi with a jam made of cranberries, jalapeño peppers, honey and orange. And one of Mr. Siegel’s favorite cold-weather dishes is a roasted magret of duck with a ragout of root vegetables studded with dried cranberries. Yet if, even after all the tinkering, you still find your relish, sauce or compote too standoffish, here’s a last-ditch suggestion: use it as a dessert accompaniment served over, say, ice cream or pumpkin pie. The extra hit of sweetness might be enough to earn the cranberry a little affection this year. Photo © 2008 David Leite. All rights reserved. All recipes and photos used with permission of the publisher.